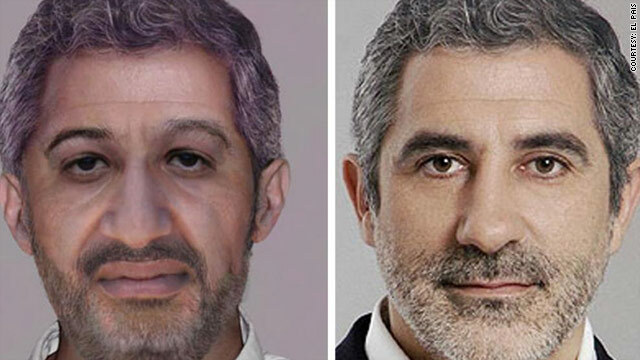 The FBI-altered image of Osama bin Laden on the left borrows the hairline and forehead of Spanish politician Gaspar Llamazares on the right. Politician says he hopes it was just a case of "incompetence"
Madrid, Spain (CNN) -- The FBI used a photograph of a Spanish lawmaker as part of a digitally enhanced Osama bin Laden wanted poster, and the U.S. Embassy here has apologized to the angry politician, a spokesman said. "That was not normal procedure. It was completely unintentional and the FBI is looking into it to prevent it from happening again," U.S. Embassy spokesman Will Ostick told CNN on Saturday. Ostick said he called the leftist politician, Gaspar Llamazares, to "express regret" on behalf of the embassy after the lawmaker's hair and forehead wrinkles, taken from a photo, were mixed into an FBI image showing the possible appearance of Bin Laden now. The embassy received various calls from the Spanish government earlier Saturday expressing concern about the use of Llamazares's features in the FBI's depiction, Ostick said. Spain's Interior Minister Alfredo Pérez Rubalcaba is meeting the new American ambassador to Madrid, Alan Solomont, on Monday, the ministry announced Sunday. The ministry did not say what they would be talking about, but the meeting appears to have been scheduled at short notice and is taking place on a U.S. federal holiday when the embassy is not expected to be open. The digitally enhanced images of Bin Laden appeared Friday on the U.S. government's Rewards for Justice Web site. One depicts how an aging Bin Laden might look now, wearing his usual turban. But the other one, depicting him without the head covering, showed the hair and facial wrinkles that were taken from a photo of Llamazares. That photo is no longer on the U.S. government's Web site. Ostick said he told Llamazares that the error occurred when an FBI "technician who put together the digitally enhanced image found an image (of hairline and wrinkles) that suited his purposes, and used it." Llamazares, an elected member of Spanish parliament from the small, Communist-led United Left coalition, said he wants to know which photo of him the FBI used, and he threatened possible legal action. Spanish newspaper El Pais reported that the Llamazares photo was from his 2004 election campaign. Llamazares told reporters that he hoped it was just a case of the "low level and incompetence" of the FBI in the fight against Al Qaeda. He said he would not travel to the United States, for fear of problems at the border, CNN partner station CNN+ reported.